I've had acne since the age of 13 which is when I first got into makeup, I spent so much money on different products and trying my best to hide it. I've gradually found the best ways to cover blemishes as well as scarring from previous breakouts too! To start I make sure I moisturise my skin, I then apply The NYX Pot Green Concealer on the areas of my skin that are red and blend it in slightly with my fingers. Over the top, with a damp Beauty Blender I apply my favourite foundation at the moment, the L'oreal Infallible 24 Hour. I love this foundation as it is full coverage and is perfect if you want your skin to look absolutely flawless, it also lasts really well on the skin and gives a nice matte finish. For large or hard to hide spots, I use the Estee Lauder Double Wear Maximum Cover Makeup to pinpoint conceal. Again, this is a brilliant product for hiding absolutely everything! Under my eyes, I use the Urban Decay Naked Skin Concealer, this really brightens the eye area, making me look a lot more awake. Occasionally I will contour my skin to give it a more sculpted look, I use the LA Girl Concealer in the shade Toast and then blend it out with my Beauty Blender again. As you can see from the 'after' photo, this did cling a bit to a dry patch on my skin and made a blemish look a little darker. So usually I would avoid it if I have blemishes in this area! To finish I apply the NYX HD Powder which sets my makeup perfectly all day and keeps it in place. 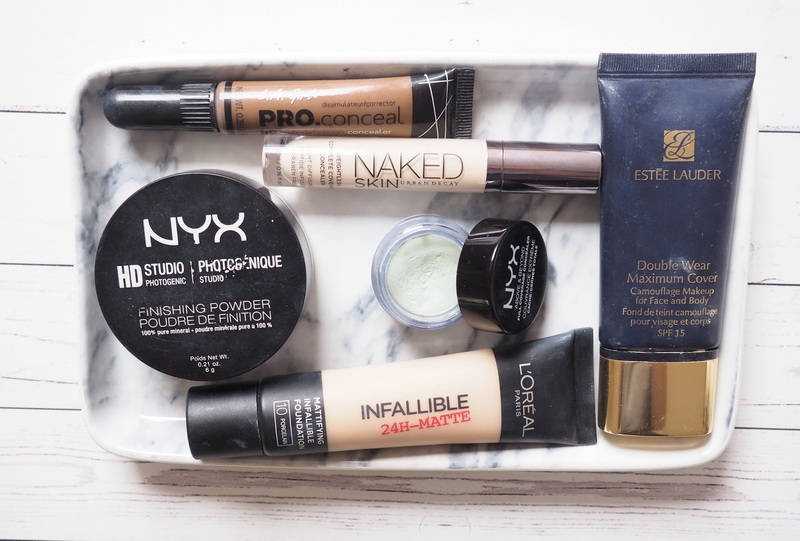 I'm really happy with the products and the routine I currently have to cover my makeup, it's a nice mix of high end and drugstore products that work well together to hide my problem skin!